Shown are our solid 14K white gold chains in assorted styles and sizes. 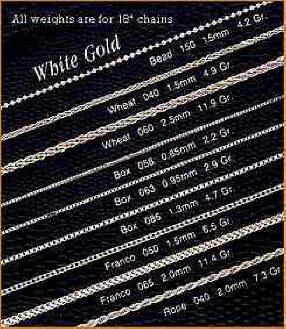 On this page we have beaded, wheat, box, franco, and rope chains. The weights shown are for 18" chains. All chains have heavy duty lobster claw clasps and are hand polished and presented in a lovely gift box. These quality 14k gold chains are available in all sizes as shown below. 22" and 30" can be special ordered. Our chains manufactured in Italy are the finest made Italian chains available. You cannot find a higher quality chain than VSC chains. Click on the picture to view the chains enlarged for detail. Shown below are the sizes available and ordering instructions. Chains as shown do not represent actual thickness. 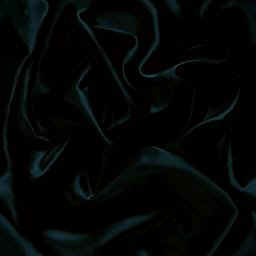 Refer to mm widths for size. This chain usually ships in 10-14 business days. To order, click on the order button below to go to a printable order form which you can fax. You can also call us toll free at 1-877-890-GOLD to order any chain. Watch for our shopping cart for our new, expanded chain section soon.